I read the judgment with some interest (thank you Mark for the link). 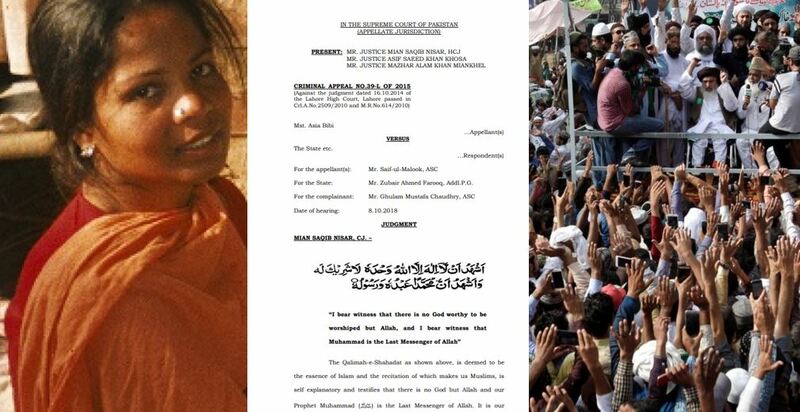 The Supreme Court has set aside judgments of lower courts and acquitted Asia Bibi on the basis that the prosecution failed to establish the case that Bibi committed blasphemy; the Court found too many instances of conflicting testimony from witnesses about just about every factual aspect of the case, casting sufficient doubt on the official version of events to warrant setting aside the conviction. After the horror nine years awaiting the noose, Bibi is finally free. In fact, Chief Justice Mian Saqib Nisar spends the first several pages of his judgment setting the context of “The unlimited and unparalleled love with Allah’s Messenger”, journeying through centuries of Islamic jurisprudence in justification of blasphemy laws and capital punishment for such offences as Bibi had been originally accused of (The Shariat Court considered section 295-C in 1991, deciding that it “was repugnant to the fundamental principles of Islam to the extent that it provided for the punishment of life imprisonment which acted as an alternative to a death sentence. It was held that the penalty for contempt of the Holy Prophet is death.” No life for you, blasphemers). Nisar CJ also gave a nod to the efforts of the Pakistani government over the years pushing to internationalise blasphemy laws through the United Nations (“condemning ‘defamation of religion’ as a human rights violation”; it’s good to know that there are some supposed human rights that the Pakistani government actually cares about). The judgment is a surreal read. I’ve spent years during my undergraduate and postgraduate study of law reading hundreds of Australian and British cases (or, more truthfully, skimming through hundreds of cases), building on the Anglo-Saxon common law tradition, which bequeathed legal systems to English speaking countries and former British colonies. But it’s something new to read a judgment, which flows from the same judicial tradition and uses all the same trappings and the nomenclature of, say, the Australian High Court, but instead discusses whether someone should be hanged for saying something offensive about Mohammed. It’s not that the British law hasn’t been barbarous in the past. For most of its history, a wide variety of offences were punishable by death, including a great many ridiculously mild ones by today’s standards. But for the last few centuries at least, the highest penalty has been increasingly reserved for the most heinous of crimes until being eliminated altogether. Religious offences have not been prosecuted for a long time. I consider blasphemy to be a victimless crime. God will punish blasphemers if he chooses to in the next life (note a several assumptions here that many would dispute, but let’s just leave it as it is); on this Earth, however, blasphemy merely offends your feels, and offending your feels (generally) is not and (definitely) should not be a criminal offence. I don’t go out of my way to insult any religions for the sake of it, but others do, and I don’t believe they should be prevented from doing so or punished for it any more than should people who offend against any other ideas. Sadly, we seem to be going backwards in that regard, in both the secular and the religious spheres. I blogged a few days ago about the decision of the European Court of Human Rights (!) that an Austrian law which in effect criminalises blasphemy to protect people’s religious feelings and preserve religious peace in the society does not offend against the EU human rights laws. Nisar CJ would probably be quite disappointed that “Mrs S, 47, from Vienna” will not dangle, but at least he would approve of the general direction of the Austrian courts and the ECHR. As for Bibi herself, her life remains in danger. Too many in Pakistan feel that the Supreme Court has failed them and their religion and would be more than happy to take the law into their own hands. Like Malala Yousafzai, Asia Bibi might have to leave in order to live.